✨ Please join PMA for our first ever Back to School Night! 🚪 Doors open at 5:30 p.m. Check out our weekly PMA Parent newsletter for 08/20/18! PMA's YES Program has started daily after school until 6:00 p.m. If you are interested in enrolling your cadet in PMA's YES program please feel free to pick up a blue application in our office! The program has started and runs daily until 6:00 p.m.
Go to portervilleschools.org and find the Bus/School Locator page under the Parents menu. PMA Parents & Cadets, sign up for Remind text notifications! Community, let us know how PMA and our cadets can support your event! 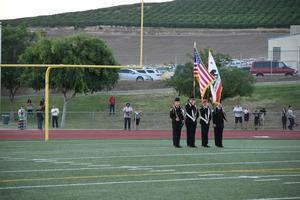 Community, let us know how PMA and our cadets can support your event! Click on the link and fill out our Google Form (Porterville Military Academy Event Request) to indicate when and how you would like our cadets to support your event whether it's Color Guard, Greeters, Class Presentation, or facilitating classroom team building activities.